i love the idea of a godzilla anime. I'm all for it: more monsters, more toys, more exposure for everything Godzilla. Very interesting. Color me curious! I'm a snob when it comes to Japanese animation. It better be quality or it can kiss my bum. Hopefully they get the people who are animating Evangelion currently because they do a good job with animating large scale action. Production I.G would be my next choice. Cool, I hope Toho really runs with an anime project. Perhaps this, currently potential, anime series is the start of Toho looking to do more with Godzilla and their other daikaiju; if so I hope it works out well for Toho. My first thought on animation studios was Sunrise, though I'm sure Toho will find a good studio to work with. Watch this be "safer" than Shin Godzilla. Huh. Curious to see what, if anything, comes of this. I'm always in favor of more Toho Godzilla, but an anime is going to have to be darn good to attract me... It's just something I've never been able to get into. But more Godzilla is better than no Godzilla in my book, so bring it on. I've wanted to see this for years. Of course I would love it to be done in the vein of a 70's Super Robot series, only with Godzilla & co. Unfortunately most modern anime is cheaply made, Looks awful, and the stories aren't much better. I miss pre-digital animation, when things could look amazing. Of course there is always the rare surprise (Gundam Unicorn), but those are few and far between. The Godzilla universe has so much to offer as an anime - think of all the potential kaiju to choose from! I really hope this isn't a Shin Goji tie in, but I will check it out regardless. Shin Goji is not a godzilla made for combating other monsters. I wouldn't get excited about the domain name purchase yet. This is standard practice as far as studios looking out for their IPs goes. Even if you have no intention of producing a certain project, if the name pertains to your IP, you have sufficient reason to buy it before anyone else can. The news is interesting insofar as Toho is doing this during a peak in Godzilla's popularity. It could mean they've been shopping the property around to anime studios, but without more information, all I can feel is hope, not hype. I'm no expert, but as best I can recall this is something new for Toho at least as far as Godzilla is concerned. Previously, Toho hasn't seemed to be all that concerned with the potential of Godzilla in an anime. Oh man, I'm really hoping this news pans out. I'd love to see a Godzilla anime! It's interesting that this move from Toho comes shortly after the Crayon Shin-Chan crossover aired. Maybe they were waiting to see the effect the Godzilla name had on the viewing figures of an already popular show before proceeding to greenlight their own anime project. Or maybe they were waiting to see the first weekend ticket sales for Shin Godzilla. The success that Ultraman has seen through international streaming on Crunchyroll may also be a factor. If something does come out of this (which I certainly hope will), I wouldn't be surprised if Anno's Studio Khara got involved - which I think would be great, considering the quality of the Rebuild of Evangelion films and the variety of the Japan Animator Expo (the latter of which included an original kaiju short and a tribute short for Gridman and Ultraman each). I'm torn. I've always wanted a Godzilla anime... But I do not want a Shin-based anime. And keep Anno far, FAR away from it. I think that's a bit unfair: people will have their own opinions and are free to like or dislike whatever they want, but I think most Godzilla fans (and kaiju fans in general, as Godzilla is the standard bearer of the genre) are happy for the movie/franchise's success and resurgence(ha!) in its native Japan regardless of whether they liked Shin Godzilla or not. Now, there are those doomsayers who say the franchise is doomed and scour whatever news that happens for proof that the genre is dead, and... um, honestly I'm not sure what to make of those people. 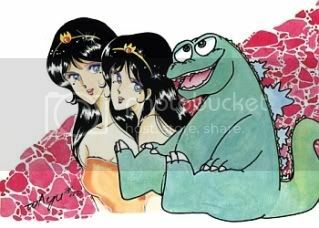 Ok, i´m excited about this, and of course, per tradition, fans will cry complain that Godzilla will appear in a japanese animated show even before the first sketches appears. What I consideer a good anime would be one that incorporates Godzilla and co with other TOHO franchised, as in an expanded universe, imagine a story ark with Godzilla fighting a Mysterian invasion (showa Godzilla vs Showa Moguera army), maybe even including unmade toho stories or creatures, (Godzilla vs Redmoon, Bagan, etc), I would love to see that. Or course, it can be also the inevitable bishoujo/(or bishonen) version. Henry88 wrote: Shin Goji is not a godzilla made for combating other monsters. ...the evolution and "perfect organism" variables pinned on Shin Godzilla make it more easily susceptible to plot-centric design changes. Godzilla's look could potentially change from film to film and the idea that he continues to "evolve" could be an easy way to explain it. MORE LASERS...toe lasers, finger lasers WOOHOOOOOO /not. I do like the idea of Godzilla's appearance changing, but am very "meh" and everything Shin Godzilla right now. I'd much rather see something new, with Godzilla and various monsters appearing in a vast universe. Some kaiju are perfectly suited for anime. Without the suit/budget restrictions films have, can you imagine how Hedorah, Gigan, Megalon, and even non-humanoid kaiju like Kumonga, Ebirah, Kamacuras, and even Mothra will work? I am drooling at the idea of a good Godzilla anime. The Great MM wrote: I am drooling at the idea of a good Godzilla anime. A Good Godzilla anime, I'm definitley open to, but if this is just a way for more of this "Godzilla vs Evangelion" nonsense, then forget it.